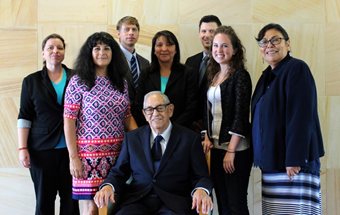 Retired District Court Judge and trial lawyer Matias Zamora (seated) and Court of Appeals Judge M. Monica Zamora (second from left), shared tips on practicing law with students in the Southwest Indian Law Clinic and their supervisor, Visiting Professor Cheryl Fairbanks (right). 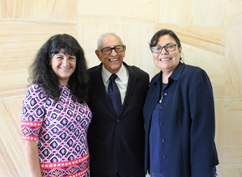 Retired District Court Judge and trial lawyer Matias Zamora and Court of Appeals Judge M. Monica Zamora (’87) shared their love of the law and tips from their extensive legal experience with students in the Southwest Indian Law Clinic (SILC). The meeting was held at the Court of Appeals, next door to the law school. Judge Monica Zamora first met the class when she performed the SILC swearing in ceremony in May. She introduced the class to her father, Matias Zamora, who practiced primarily as a personal injury lawyer. Both are experienced trial lawyers and judges. The tips they shared with the students are summarized below. The law is an honorable profession, and honest lawyers always succeed. Be truthful to yourself and to your client, the judge, and the jury. Judge M. Monica Zamora, Matias Zamora and Visiting Professor Cheryl Fairbanks at the Court of Appeals next door to the law school. Study your case and learn it inside and out. Be very thorough in preparing so you don’t get caught off-guard. Use your knowledge of the case and memory instead of relying heavily on your notes for opening and closing arguments and deposition questions. Matias Zamora with Bryan Rowland ('17), Kelsea Raether ('17) and Visiting Professor Cheryl Fairbanks. Mr. Zamora said he initially viewed jurors as “cardboard faces.” When he spent time getting to know them and relate more to them, he saw them as real human beings trying to do an honest job. Mr. Zamora had extensive experience getting along well with opposing attorneys. He recounted a story of driving to an out-of-town courtroom with the opposing attorney, sharing the same hotel, arguing their cases during the day, then going out to dinner together. If the opposing counsel is nasty, don’t get caught up in it. It’s important to be professional at all times. Effective advocates need to use their creativity and imagination more, especially in the courtroom. Judge Zamora shared how she effectively developed an accident reconstruction to demonstrate difficult concepts to the judge and jury. “We don’t use our imagination enough as lawyers, but it’s so important,” said Fairbanks.